Sochi (VNA) – The Party, State and Government of Vietnam always regard Russia as a significant strategic priority in their diplomatic policy of multilateralisation and international integration, stated Prime Minister Nguyen Xuan Phuc. He made the statement at his meeting with Russian President Vladimir Putin in Sochi city on May 19 on the sidelines of the 20th ASEAN-Russia Commemorative Summit. The meeting took place in a friendly, trustful and open atmosphere, during which the Vietnamese PM expressed his pleasure to pay an official visit to Russia and briefed the host about the socio-economic situation in Vietnam as well as the outcome of the 12th National Congress of the Communist Party of Vietnam. He pledged that the Vietnamese leadership will proactively work to enhance the traditional friendship and comprehensive strategic partnership between the two countries in a pragmatic and effective manner. In turn, President Putin congratulated Nguyen Xuan Phuc on his new post while hailing the role of Vietnam in Southeast Asia and confirming that Vietnam is one of the external priorities of Russia in the Asian-Pacific region. Amid the regional and global changes, the bilateral cooperation has grown actively across the fields from politics, economics-trade, and security-defence to science-technology, education-training, culture and tourism, he noted. The two leaders agreed to strengthen coordination to implement effectively key collaborative projects and programmes, especially in trade exchange, oil and gas, nuclear power, and tourism to lay a foundation for the expansion of bilateral affiliation into other fields. The Russian leader promised to urge other members of the Eurasian Economic Union, namely Belarus, Armenia and Kyrgyzstan, to complete the ratification of the free trade agreement (FTA) with Vietnam in a bid to enhance the bilateral economic, trade, and investment ties in the coming time. 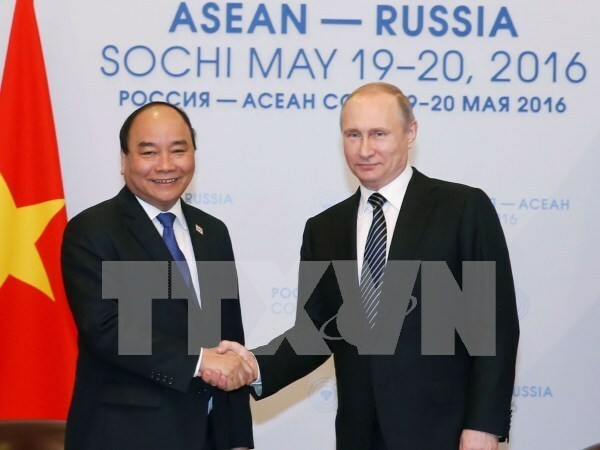 PM Nguyen Xuan Phuc said Vietnam is willing to serve as a bridge to help Russian enterprises expand operation in Southeast Asian markets and ASEAN, especially when Vietnam has signed and got engaged in a number of FTAs with foreign countries and organisations. He thanked the Russian President for directing relevant agencies to support overseas Vietnamese to do business and expressed his hopes the host society will provide more assistance for Vietnamese expatriates. During the meeting, the two leaders exchanged various regional and global issues of mutual concerns. They agreed to boost cooperation at multilateral forums of the United Nation, the Asia-Pacific Economic Cooperation (APEC), the Asia-Europe Meeting (ASEM), and the Association of Southeast Asian Nations (ASEAN). He congratulated Russia on hosting the ASEAN-Russia Summit and expressed his confidence in the event’s success, which will help elevate the two sides’ relations to a new height. He also affirmed to enhance Vietnam-Russia cooperation within the framework of ASEAN-Russia ties. Touching upon the recent complicated developments in the East Sea, President Putin said Russia is keeping a close watch on the situation in Southeast Asia and particularly the East Sea. He reiterated Russia’s standpoint of resolving any disputes via peaceful means and in respect of international law, including the 1982 United Nations Convention on the Law of the Sea (UNCLOS), while implementing fully and effectively the Declaration of Conduct of Parties in the East Sea (DOC). Russia also supports ASEAN and China to jointly build a Code of Conduct in the East Sea (COC), he added.